Before coming to KCEOC in early 2014, Ann Blakely was living in unimaginable conditions in the Woolum community of rural Knox County Kentucky. Her house was falling apart in more ways than one, and she was living in an unsafe and hazardous environment. She had no central air, or a way to cool her home. She had a coal stove that she used in the winter, but it was not effective. The temperature outside was the temperature inside. She had no running water in her house. She would walk to her sister’s house to get a bucket of water to bring back to her house. She would have to wash dishes, clothes, and bathe in her sink by continuously venturing up the hill to get more water. The septic system did not work, and she said that if you went into the bathroom there were so many gnats that you could not see. She put a gnat catcher up, but it did not help, and the smell during the summer was unbearable. The roof was caving in and the house was sunk in a hole. The floor was not level, and there were holes where you could see the ground. They had boards laid down so they could walk through the house. Because of this she was unable to keep rodents and bugs out of her home. To get to the bedrooms where she slept you would have to step off the floor, into the hole, and get into bed that way. 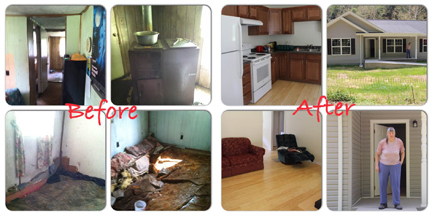 She had no appliances in her home, no cabinets to store her belongings, nothing that could make this feel like a home. She knew that she could no longer live like this, and had to make a change for her safety and health. Ann came to KCEOC and applied for the HOME Homeowner Rehabilitation Program. After the examination of the house and her finances, Ann qualified and was approved for the program. HOME funds in the amount of $60,000, leveraged with from USDA Rural Development $54,775), Appalachian Regional Commission $5,000), and Federal Home Loan Bank ($1,000) were used to build a new home for Ann. Through a HOME demolition/reconstruction homeowner rehabilitation project, KCEOC completely tore down the house and started from ground zero. The total project costs, including financing and volunteer labor and material was $123,035. The house was finished in April, 2015. During the time the house was being built, she would have nowhere to stay. As part of her participation in the program, KCEOC provided an apartment for her to live in while the house was being built. As you can imagine, compared to her previous circumstances, the apartment was great. She walked in the apartment and was in awe. She felt the warmth and heat of the apartment, which was a great change from the frigid conditions she was living in before. She said that she wore short sleeves in the winter, and that is the first time she could remember doing that. She walked into the kitchen and saw cabinets. Ann stated this is the first time she ever had cabinets. Her and her sister turned the sink on and smiled watching the water come out. She touched it, and was already comforted in knowing this is what she will soon be living in. Ann was also a participant in the Housing Counseling Program. KCEOC is a HUD approved Housing Counseling agency, and we have formally adopted the National Industry Standards for Homeownership Education and Counseling. Ann felt as though she was living in a prison under her circumstances. She didn’t have the knowledge about homeownership, and was living in conditions with no water, heat, or basic necessities. Being a limited low income individual, Ann did not see change as a possibility. Ann inherited her parents’ home that was built in c1955. She never carried a mortgage, and was not aware of what it is like to be a homeowner. Through the Housing Counseling Program Ann learned how to think like a homeowner. She learned about home maintenance, budgeting her income, how to save money, the buying process, all aspects that go into a mortgage payment, and gave her the skills to become a successful homeowner. The housing counseling program allowed Ann to obtain a new found confidence, pride, enjoyment, and independence. She could leave her home now knowing the processes she needed to take, how to take care of her home, and an understanding of the resources available to her. She broke through the walls of poverty that bound her, and prevailed in a new place that she can call home. Once KCEOC started building the home Ann would come check on it every weekend. She watched it be built throughout the whole process and even participated with some minor work herself. She would sit on the porch, and know soon this would be her new home. When the house was complete, Ann walked up her new large porch and says she opened the front door and stood in the doorway looking down. KCEOC employees asked what she was looking at, and she responded, “I can’t believe the floor is off the ground, there are no holes, and it is level.” As she walked through the house there were laminate floors, two nice bathrooms, a dining area, a front load washer and dryer, a stove, a refrigerator, and many cabinets. The roof was perfect, the floors were perfect, and everything was perfect. Ann says this changed her life immensely and forever. Ann says with her age and health it is harder to get around. Now her house is handicap accessible, so she no longer worries about the future and “what ifs.” She says she will no longer get as sick because she can now stay warm and cool. Also, she is excited to keep her house clean, and not have to sweep up coal. She also says the running water will help greatly. She will no longer have to make the long walk to get water, and will no longer have to pay half of her family’s water bill just to be able to access their water. She can now wash her clothes in her brand new front load washer, dry her clothes thoroughly, cook dinner at night, store her belongings, use the restroom in the house, bathe, and lay her head to rest at night knowing she is safe and has a stable roof over her head.